I am standing under the shadow of Jaffa Gate, the imposing entrance to Jerusalem’s Old City. It’s post breakfast hour, the golden hour for all things touristy. On the day’s list is a walking tour of the 3,000-year-old Old City, a walled settlement on the eastern side of Jerusalem, which will take us through its Christian, Muslim, Jewish and Armenian quarters. As I wait for our group’s guide Joshua to flag off the tour, my eyes adjust to the swarm of tourists trundling in and out of the gate, which is among the eight original ones built in the 16th century by the Ottomans. Like us, the sun too is preparing for a long day ahead, but the cool breeze tempers it slightly. Before we get impatient, Joshua is ready for us. He offers a pithy introduction to the city and its history—with a brief plan for the day that comes with a rather rousing disclaimer: “This is the Middle East, anything can happen.” It’s Joshua’s way of preparing us for ad lib changes in the route due to possible unrest, although he won’t say. There’s another request we comply with: submit all items of clothing or accessories symbolic of any religion other than Islam. I had nothing on me except a Hand of Hamsa keychain, which I let go of temporarily. Granted, the amulet, popular across the Middle East and North Africa can be considered equal parts Jewish, Christian and Islamic, but why take a chance? As we walk in through the gate and step on the cobblestoned road of Old City, it feels like we are on the sets of a period film. This is a theatre of all things sacred, the only place of its kind where the highest symbols of three faiths—the Western Wall for Jews, the Church of the Holy Sepulchre for Christians and the Dome of the Rock for Muslims—stand within a stone’s throw of each other. We are a little Pied Piper’s army, following Joshua’s quick strides through the narrow alleyways of the Christian quarters, scurrying past souvenir shops on both sides before we find ourselves on the courtyard of the Church of the Holy Sepulchre. It was first built in the fourth century by Byzantine emperor Constantine to venerate the site believed to be that of Jesus’s crucifixion, burial and resurrection. Over 16 centuries, this church has been excavated, destroyed, rebuilt and renovated—a phoenix etched in stone. Whether or not you know of its tangled past, you cannot miss the architectural patchwork on the outside, which appears unfinished. Six Christian sects, including Roman Catholic, Greek Orthodox and Armenian Apostolic share control of the building. All things seemingly odd and wanting to touristy eyes signify an uneasy truce between local churches, often put to test in matters of maintaining tradition. Take for instance, an old ladder sitting on the upper level of the church. It has not been merely forgotten there by a repairman; or if it was, it happened centuries ago. The Immovable Ladder, as it came to be called, has occupied that position for as long as anyone can recall, because rival church denominations have not been able to agree on what to do with it. As we enter the church, we see the Anointing Stone, where Jesus’s body was kept after it was removed from the cross. It’s encircled by kneeling tourists, in various stages of prayer and mourning. I take in the interiors, a lilting sequence of light and dark marked by wall mosaics of Biblical paintings. There are queues everywhere, whether you want to just light a candle or see Jesus’s tomb. But, it’s the Holy Week (the week before Easter) that would put your devotion to real test, because that’s when crowds peak to partake in a gamut of prayers and processions from dawn to dusk and beyond. The Holy Sepulchre or tomb of Christ is located in the centre of what’s called the Rotunda, a round hall supported by 18 massive columns. It’s a wealth of ornate altars and domes inside. I fight the urge to run off to every corner of the church, but not all corners welcome tourists as Joshua warned us. A very steep stairway will take you to the Golgotha, where Jesus was crucified. Scrambling tourists won’t let you linger anywhere, so one takes in the splendour in retrospect, largely. Within such a rich ecosystem, you switch between multiple open tabs of religion and history. We negotiate a 10-minute labyrinthine walk to reach the Western Wall in the Jewish Quarter. 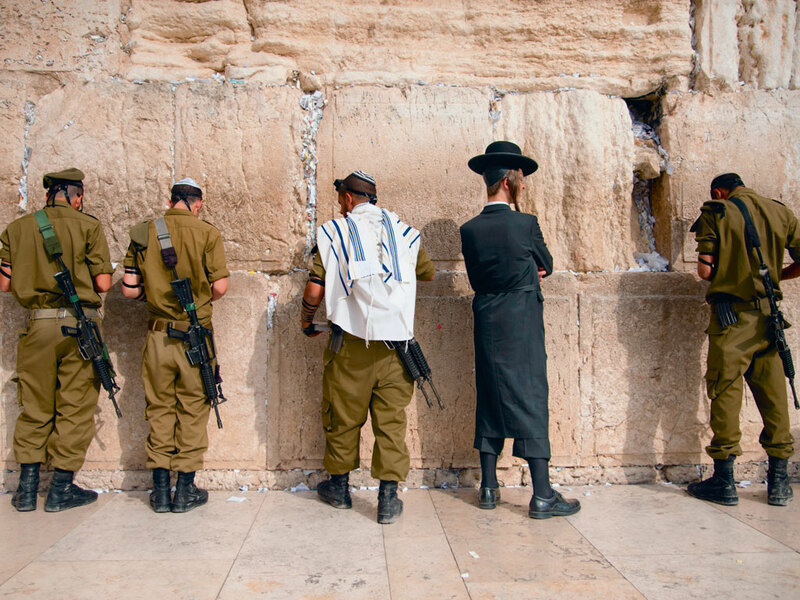 A preliminary round of security checking awaits us at the 187-foot-high structure, also called the Wailing Wall. People are scattered around the plaza, and seated on a row of chairs facing the wall—significant in both Judaism and Islam for its chequered, often contested history. For the Jews, it marks the only remains of the Second Temple of Jerusalem, destroyed by the Romans in A.D. 70. When the Muslim shrine of Dome of the Rock was built at the same spot during the late seventh century, the wall came to form a part of a larger wall that surrounds the dome and the Al-Aqsa Mosque. This means that entry to Temple Mount, the hill that houses the part of the wall in the Muslim quarters, is restricted for Jews. On the other side of this wall in the Muslim quarters lies Dome of the Rock, that UNESCO calls Jerusalem’s most recognisable landmark. Another round of heavy checking by security forces awaits us. I realise that the religious items we surrendered at the beginning of the tour was to avoid complications here. In the tinderbox that is the Old City, the smallest of precautions count. 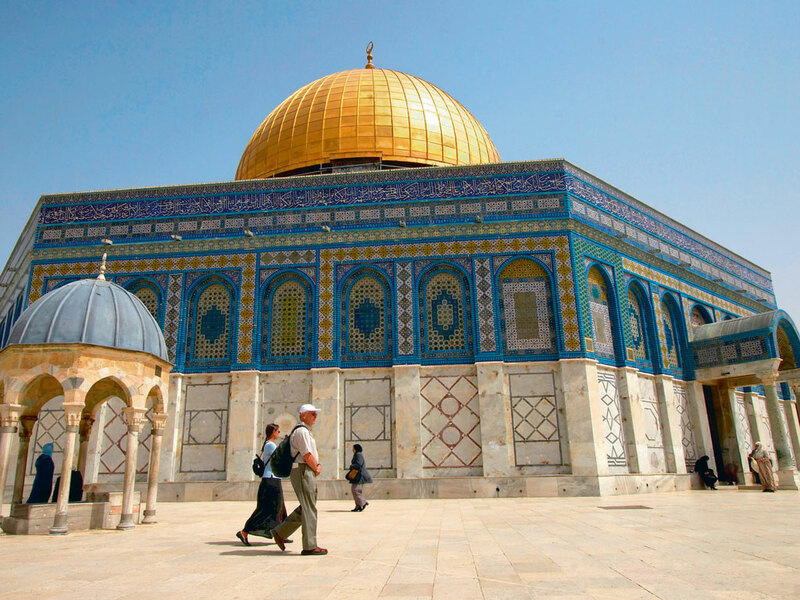 The ornate Al-Aqsa Mosque, Islam’s third holiest site, sits on a 35-acre compound that the Muslims call the Noble Sanctuary, and the Jews, Temple Mount. No matter how modestly you’re dressed, you’ll be asked to slip into hoodies and ankle-length skirts before you enter this compound. It’s easy to spot the tourists here. We are like penguins covered in aquamarine hoodies loitering under the afternoon sun. Joshua says we must cut short our time here as we begin to spot security forces wearing tear gas canisters, in numbers more than usual. We make our exit, full of questions best unasked. 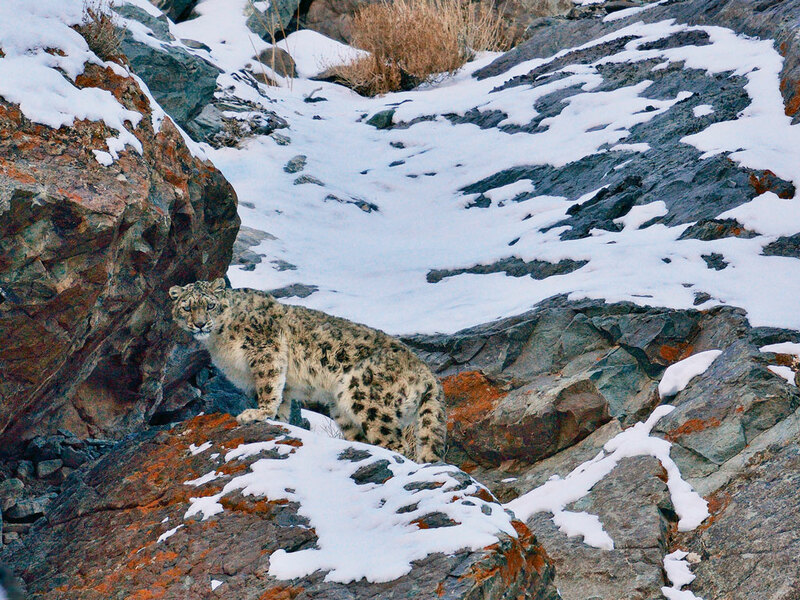 “Anything can happen”—our guide has taught us well. While the quarters have been boxed, history cannot be. The Muslim quarter also marks the starting point of Via Dolorosa (Way of Sorrows), a processional route believed to be the path Jesus walked carrying his cross, on the way to Crucifixion. On Good Friday, thousands of Christians from around the world come here to retrace Jesus’s footsteps either by watching the procession, or actually carrying a cross all the way to the Holy Sepulchre, covering the Stations of the Cross, nine spots that commemorate the events that happened on the way. Whether or not this is the exact route that Jesus took is disputed, but its credence has been established by the footsteps of the devout over centuries. If the crowds get too much for your endurance, catch your breath atop the Tower of David museum. While the museum will give you an overview of Jerusalem’s intricate past, the rooftop lets you absorb it from a glorious elevation. The different neighbourhoods and patches of history appear so seamlessly stitched together that you almost forget its segregated reality. 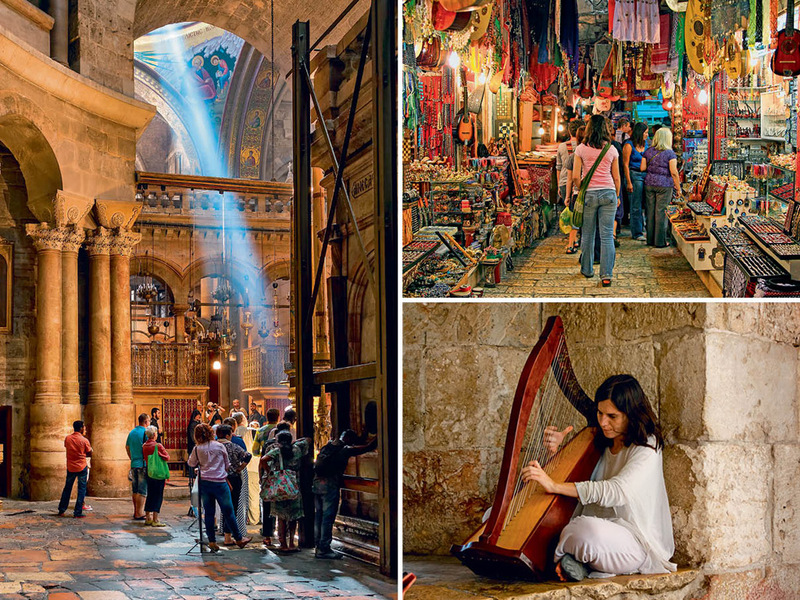 Finding yourself at Via Dolorosa also means elbowing your way through a teeming Arab souk. The mercantile heart of Jerusalem from the Ottoman times, this place is a cornucopia of baubles, hookahs, spices—the warm aroma of zaatar is intoxicating—lutes, watches, attars, dry fruits, on-the-spot-ground coffee, dates and even glow-in-the-dark crucifixes. Prepare to be ambushed by vendors, keep your haggling hat on and stay hydrated with fresh pomegranate juice that could only have been blended by a holy miracle. 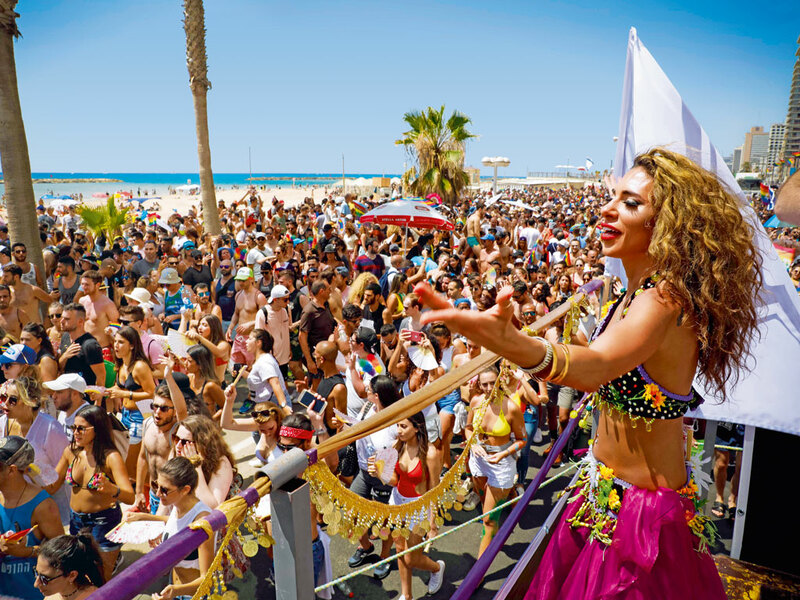 Kebab, falafel and shawarma stalls are aplenty, but, for more authentic eats, try the sefiha, or pita stuffed with ground meat and tomato sauce, the Arabic pizza at the ancient Green Door Pizza Bakery, and beigeleh or the Jewish- Arabic bagel, enormous breads coated with sesame seeds, served with zaatar on the side. For tipplers, there’s freshly brewed Palestinian or Israeli beers at Café Rimon. 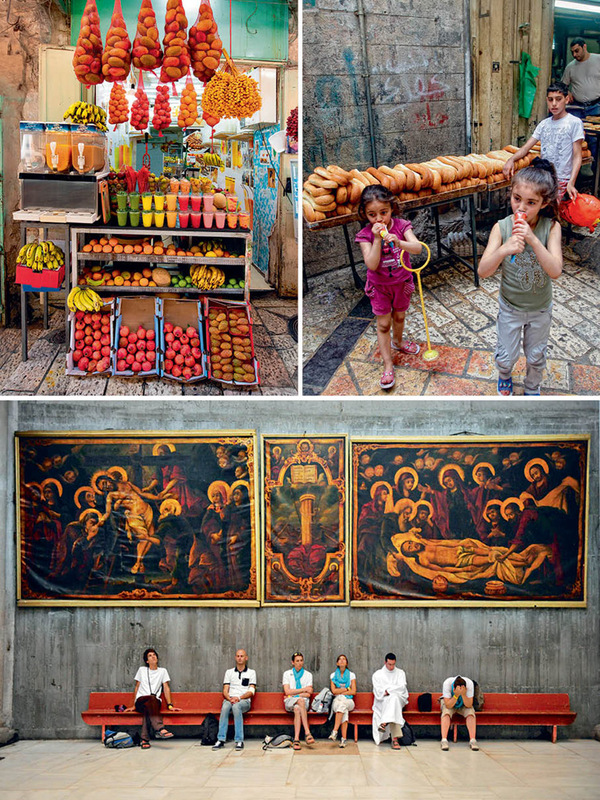 Another must-visit is the Mahane Yehuda Market, outside the Old City, in the heart of West Jerusalem. A treasure trove of fresh produce, in the recent years it has also become a yuppie hub of boutiques, pubs and top restaurants. 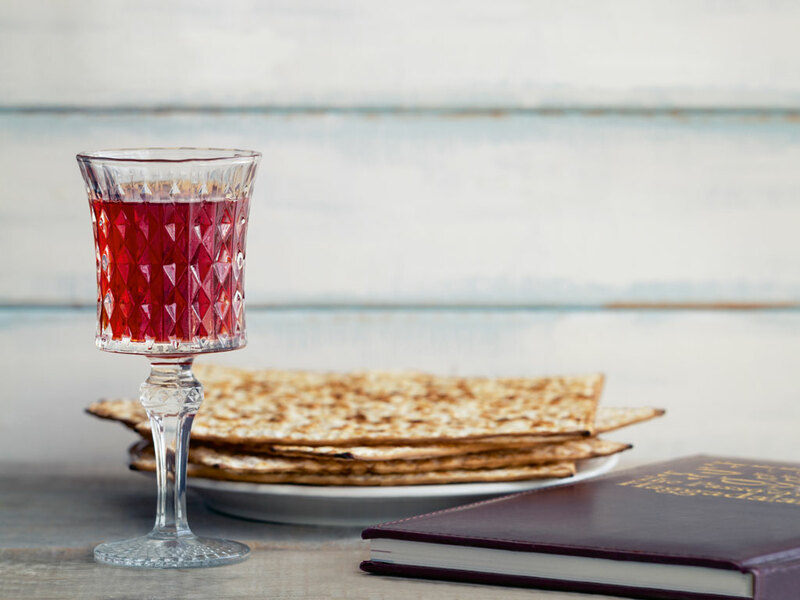 It’s especially known for the culinary workshops and tasting tours held during the Jewish Passover or the Pesach week, close on the heels of Easter. The sloping streets of Jerusalem offer good exercise for pedestrians. 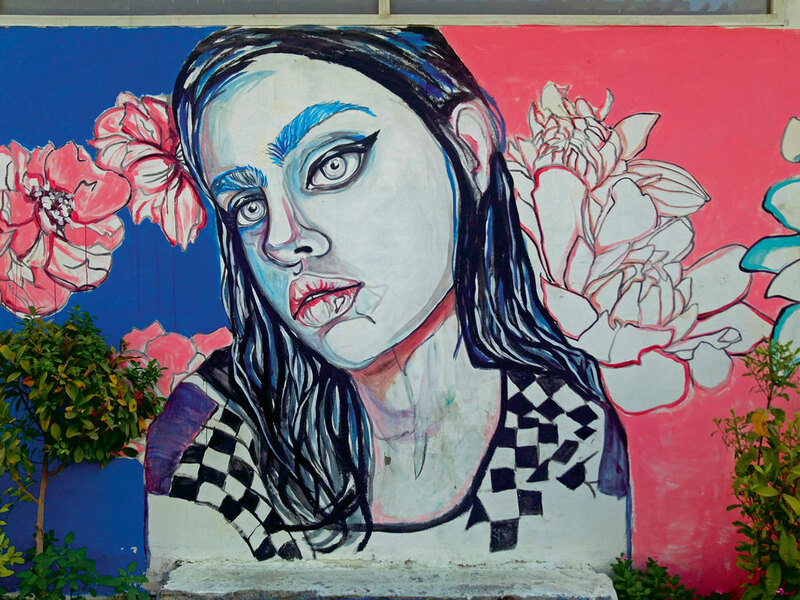 Take in the murals and graffiti along the way—they are as stunning as they come—especially on the closed shutters of this market during Sabbath. Even as the media continues to be conflict-obsessed, Jerusalem is increasingly finding itself in the tourist radar. It was voted the fastest growing tourist destination last December by a U.K.-based agency Euromonitor International. 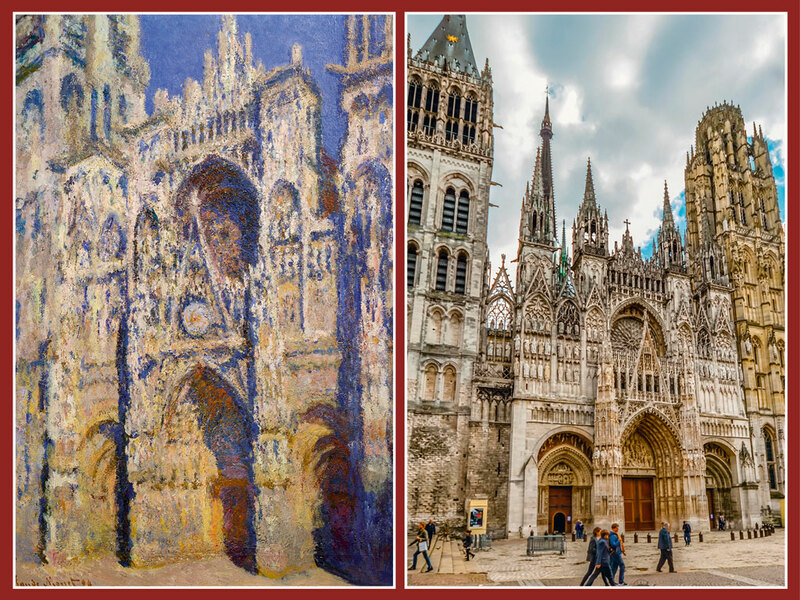 The city wears religion like a stunning patchwork cloak and nothing is apolitical here, but that’s also one of its draws. Here it’s normal to share a table with young soldiers enjoying a cup of coffee even as their rifles rest on chairs. It’s an extraordinary city caught in extraordinary times and you’re never too far from a reminder. But there are also street musicians to play you a tune to follow till you lose sense of time. So long you keep the tramway in sight, you’ll find your way back. 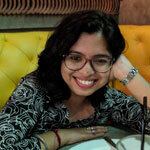 Kusumita Das is a freelance writer based in Mumbai. Her favourite word is serendipity and that’s exactly what travel means to her. 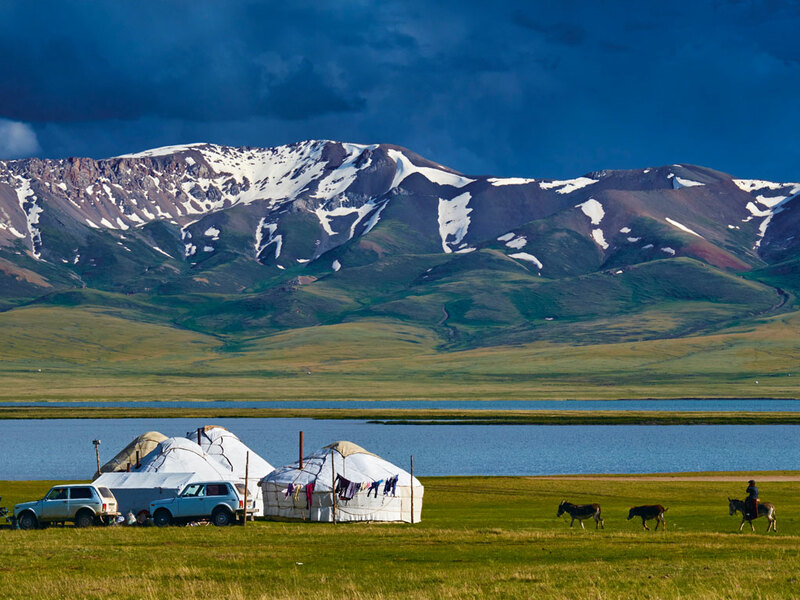 An overnight train journey to the mountains is how she defines a perfect holiday. That combined with lots of tea.